Do you want clear, bright, unblemished, beautiful skin? Would you like to look younger, sculpted and refreshed? Do you want to get a good night’s sleep even though you’ve been ultra-busy? Then acupuncture is the beauty treatment you’ve been looking for. The health benefits of acupuncture can work wonders for your skin. Acupuncture isn’t just a superficial beauty treatment, it goes deeper than skin to heal the body. Acupuncture benefits your skin by improving your overall internal health. Stress, pollution, lack of sleep, hormone imbalances, poor nutrition and more, throw your body and skin out of whack. When you’re healthy and balanced on the inside, it’s reflected on the outside with a radiant complexion. Acupuncture helps restore the body’s ability to heal itself and harmonizes the sleep cycle, menstrual cycle, digestion and other natural cycles. What else can acupuncture do for your skin? Cosmetic acupuncture can help address the root causes of aging (dark circles, puffiness and fine lines) by stimulating the skin to produce more natural collagen. It’s a great alternative to procedures like Botox and Juvederm. Acupuncture is an effective treatment for acne as it reduces inflammation. Try acupuncture instead of heavy-duty chemicals or peels. 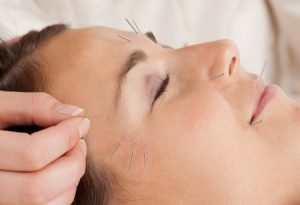 Acupuncture can brighten a dull complexion by increasing circulation to your face and nourishing your skin. After your treatment, you’ll look and feel refreshed and rested! Now that you know how facial acupuncture can help with your skin’s health and beauty, check out our facial rejuvenation services. Contact us today to find out how our treatments can give you the fresh, healthy skin of your dreams!